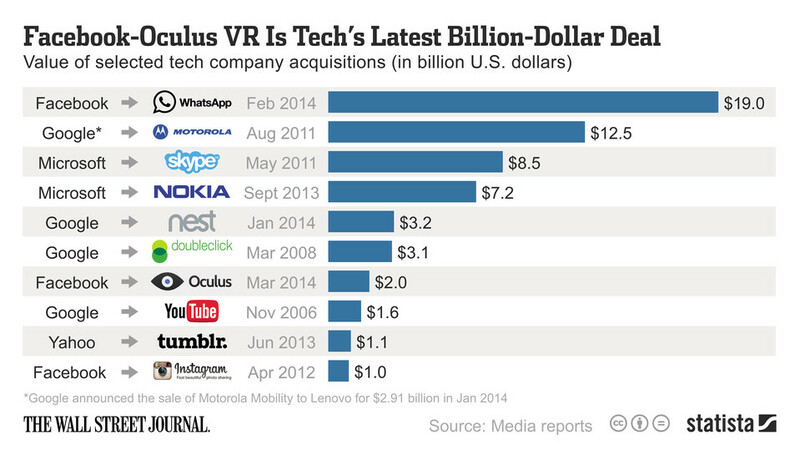 The ink is barely dry on the FacebookFB -7.46%-WhatsApp headlines and the social network dropped another stunner of a deal: $2 billion for Oculus VR. The deal for Oculus, which makes a virtual-reality headset called Oculus Rift, is just the latest 10-figure tie-up for the nation’s tech giants. Go back to 2006 and you can findGoogle'sGOOG -2.36% deal for YouTube, then a head-turning $1.6 billion. In recent years, hefty deals are heating up, data compiled by Statista show. Facebookalready is shelling out $19 billion for the messaging app WhatsApp, while Google earlier this year dropped $3.2 billion for the smart-device gadget maker Nest.